We take intentional steps to initiate and accelerate the healthy recovery of the city’s forested parkland. Over the past ten years of the program, we have realized restoration can take many forms, and a one-size fits all approach won’t always work in order to honor the diversity of forests and stakeholders involved in the citywide restoration effort. It might seem counterintuitive, but in much of the western United States these days, restoring the health and integrity of native forests means cutting trees. Cities, counties and non-profit groups have inherited a legacy of degraded land and former industrial forestland that is susceptible to fires, landslides, and deceasing biodiversity. In Seattle, our forested natural areas are recovering from land use practices that replaced complex forest ecosystems with denuded landscapes (in some instances) not conducive to sustaining the benefits of a Pacific Northwest forest. Professional staff have systematically been removing the most persistent non-native tree species, like English holly and cherry laurel. These shade-tolerant trees can comprise over half of all the regenerating trees in Seattle’s natural areas, more abundant than a future forest of native seedlings. Removing invasive trees is a way in which we can promote the growth of desirable vegetation that will benefit the environment and community over the long term. Parks and Recreation Tree Crews strive to maintain landscape trees, although crews also remove trees in the more formal Park landscapes that staff arborists consider to be hazards to public safety. 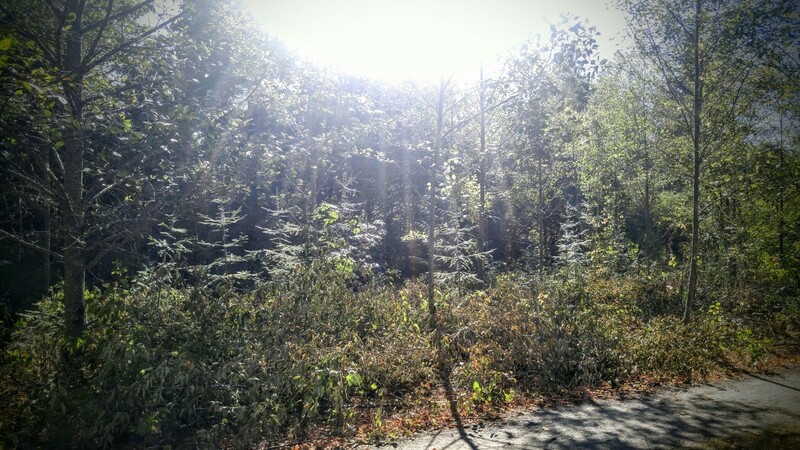 In 2016, restoration crews completed the Kennedy 500 restoration thinning on a young, native stand of red alder (densely planted in 2002 after a building demolition) to “release” the longer-lived conifers planted in the shady understory. Also, we completed a smaller restoration thinning at Llandover Woods to reduce tall, skinny suckering stems of bigleaf maple that had been falling on the formal trail system for a number of years. The practices and projects noted above have given us the experience and confidence for the next phase of stewardship and long-term management of our forests. 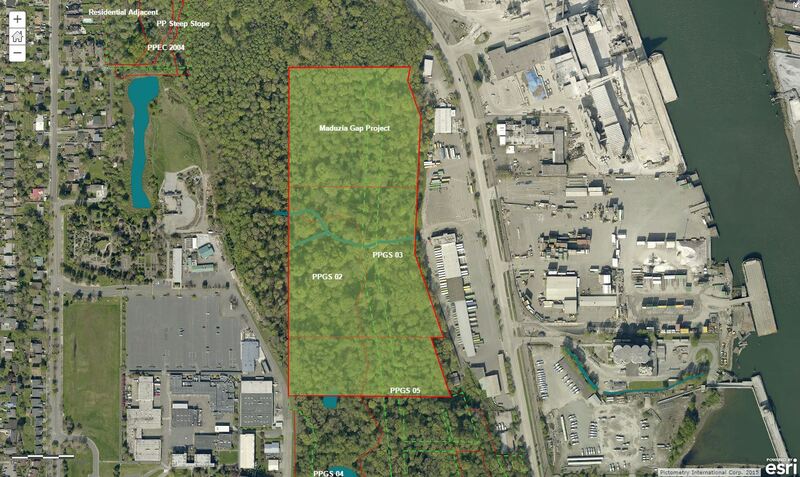 For the first time this year, we are going to carry out a more significant thinning and gap enhancement project over 24 acres in West Duwamish Greenspace: Puget Park. The site is located on the hillside between South Seattle College and West Marginal Way; a webmap of the project area can be found here http://arcg.is/1Dzvm1. Beginning in mid-August after the primary bird nesting season, professional crews will carry out a restoration prescription to thin red alder and bigleaf maple up to 30% and create small gaps in the canopy to allow more light to the forest understory where underplanted conifers await favorable light conditions. We have no mandate to sell any timber, and no wood will leave the site; the intention is for the larger wood to become nurse logs. The crews will also enhance wildlife habitat through retention/creation of snags and build habitat piles with excess slash material. Activities also include weeding and major replanting of tree seedlings over the 24 acres + 16 additional acres lying to the south. With more light and subsequent replanting of 10,000 native tree/shrub seedlings, we expect this effort to let the remaining trees grow big and healthy that remain for future generations. Thereby, we hope to achieve all the associated environmental benefits that come along with more diverse, mixed conifer-deciduous forests. Why now? Up until this part of the GSP 20-year program we haven’t removed native trees (except when hazards are present) because we have been very focused making progress with traditional methods of removing invasives and planting – all in the forest understory. Some of our forests in active restoration now have fewer invasive plants. We have shifted all our planting towards shade-tolerant conifers and sometimes struggle to grow young evergreens in tough conditions – they just aren’t growing gangbusters under a closed deciduous forest canopy. We have taken a number of years to research and plan the right silvicultural methods to use under the right conditions. It also took time to conduct external outreach and engagement to key stakeholders to vet and gather feedback on the concept. Here is what we have learned – Many Northwest forests are typically made up of coniferous trees with a smaller mix of deciduous trees. Various reports from the last few years have estimates of natural area conifer cover ranging from only about 30 percent to 60 percent in the 2016 Seattle Tree Canopy Assessment. The distribution of conifers is uneven; in the parks designated as “Greenbelts,” we lack mature conifers to contribute their seed to future forests. Intense shade from dense canopy (along with high understory cover and lack of woody debris) are partially the reason why our understory seedlings experience mortality rates as high as 90 percent. The dominant, early successional species of red alder generally colonize sites at high densities, reaching their maximum height in approximately 40 years. Some trees are growing taller, reaching for light, but are not simultaneously growing a healthy diameter and lack sturdy foundations. Height/diameter measurements tell us a good amount about a tree’s ability to withstand winter storm events. When alder in particular begin to decline, individual trees fall to the ground, but surrounding hardwoods often have a high enough degree of “plasticity” to seal any gaps. This process can maintain crowded stands of trees of the same species, which can be potentially susceptible to stress, drought and attacks by pests. We don’t want to demonize these other tree species. They both play an important role in Puget Sound lowland forests. However, the problem in Seattle’s forests remains the same: many hardwoods that dominate much of the forested parkland are reaching the end of their lifespans. Greater transparency through those leafy summer canopies allows us to grow our planted seedlings to maturity and further recruit new conifers naturally. We have learned through literature review and evidence on the ground that gaps of at least ¼ acre (at least 20 feet wide) and increasing light availability to at least 30% can support good conifer production. The practice of thinning and creating gaps means removing trees from dense forests to help reconstruct more natural and complex forest structure. This encourages longer-lived conifers to grow taller and thicker, produce the seedlings of a future forest, and enhance a wider array of plant diversity at the same time. Thinning and similar silvicultural methods to increase conifer growth and native plant diversity are fairly commonplace on private, state, and county lands. The City of Seattle is now implementing plans in Seattle’s watersheds that no longer mandate commercial harvest, and are focused on a long-term restoration program. 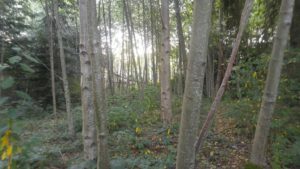 Though this type of forestry practice is unfamiliar in the city, Seattle Parks and Recreation’s Natural Resources Unit has taken deliberate steps in recent years to evaluate our best management practices and the options for future management of forested parkland. Moving from concept to implementation, Seattle Parks and Recreation became the first urban forest manager in the U.S. to earn Forest Stewardship Council certification, and then consulted with the Northwest Natural Resource Group to identify potential projects in which to implement these methods. While the sound of a chainsaw will break the quiet peace of a Seattle greenbelt in the spirit of restoration, this activity will NOT AT ALL result in the classic scene of deforestation by creating a clearcut and bare ground that we never replant. This work will only be appropriate for a subset of acres around the city, respecting important considerations such as slope stability, habitat, wetland presence and public use. 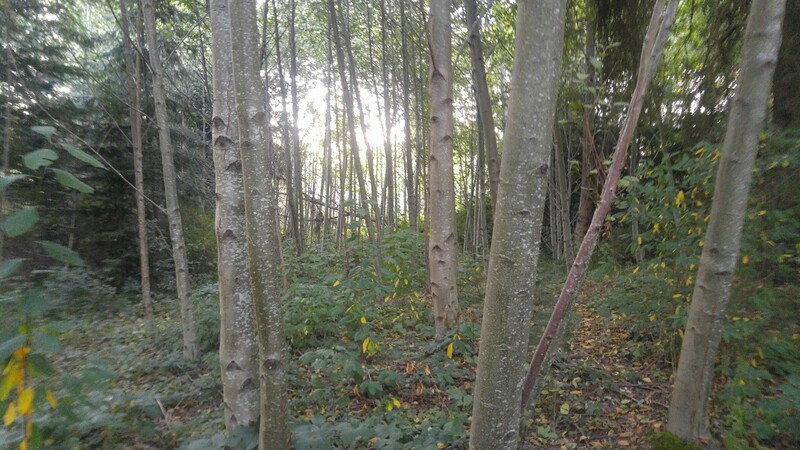 In the future we will consider other projects where thinning/gap creation has already been identified as options in Seattle Park’s Vegetation Management Plans, but first, Puget Park will be our first test of ecological forestry methods to showcase our sustainable forest stewardship and management. If interested, please join us Saturday, July 8 at South Seattle College’s Chan Center at 10am. South Seattle College is located at 6000 16th Ave. SW, Seattle, WA. The Chan Center is situated on the north end of campus. This will an open house-style event with a briefing with Seattle Park’s staff. An optional walk through the Puget Park site will be offered. Feel free to leave comments or questions below. Want to know more? More detailed questions about the project and/or public meeting can be sent to Michael Yadrick at Seattle Parks Natural Resources Unit: michael.yadrick@seattle.gov. Also, follow the GSP Facebook page and Twitter for announcements and information. Thanks for the efforts here. More feedback to the public is always better. We (the public) don’t get to see, or have time to investigate, google, or whatever, much of what is on-going in and around the city. And who would have thought it would be so complicated? Once upon a time, there was a dream. Restore the forest to active sustainability. Now,decade’s of work are proving that it can be done. Thank all of you for making a better world for us all. 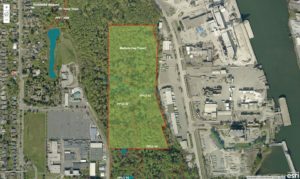 One hour and 10 minute video of proposed Seattle Parks plan to thin forest near South Seattle College. I have a dense conifer pattern (firs) on my nine acres located in Olalla, WA. It seems that thinning might be appropriate. Because I live on the other side of the world (Guam) I cannot be there in Olalla to look after the health of my patch as much as I would prefer. I know you are all about Seattle but could you recommend a public service organization to take care of thinning for me? Commercial sources are available but I wonder about their concern for planning and the public interest in a case like his. Thank you. Lee. Lee, check out your county’s Conservation District. I know King Conservation District provides forestry advice and cost-share programs to help landowners manage forest land on private property. Agree with Madeline. Touching base with Kitsap Conservation District is always a good move http://kitsapcd.org/. Northwest Natural Resource Group http://www.nnrg.org/our-services/forest-restoration/ is our consulting forester on the Puget Park project. In some cases, I think these two groups can work together to provide a variety of services to small forest landowners. Best! This is a SUPERB article describing the science and issues. No doubt it will be more difficult in a live conversation with the public to convey these details and the complexity of this forest management approach. But go forward with good courage. Those of us who volunteer at Carkeek Park and have advocated for thinning understand the issues and I, for one, am patient about when we may be able to do such work in a high visibility park such as Carkeek. Thanks for starting at Puget Park.